In the following we present a collection of test cases aiming at the evaluation of model versioning systems. Description: Two different associations are added between two classes. Origin Version:Two unconnected classes A and B. 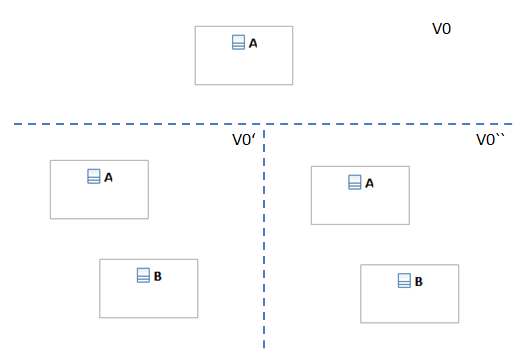 Working Copy 1 (V0'):The association x is added between A and B. Expected Merge Result:Both associations are included. Description: This scenario tests the granularity of the conflict detection.Two properties of an attribute are changed independently. 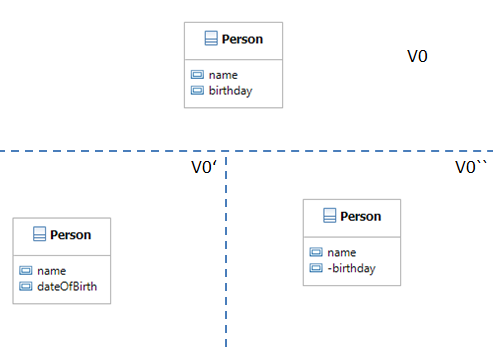 Origin Version A class Person with the attributes name and birthday. Working Copy 1 (V0'): The attribute birthday is renamed to dateOfBirth. Working Copy 2 (V0''):The attribute birthday is set to private. Expected Merge Result:Both changes are included in the merged version. Origin Version:A class containing at least one operation. Working Copy 1 (V0'): The operation is moved into a superclass. Working Copy 2 (V0''): The same operation is renamed. Expected Merge Result:Renamed operation is in the superclass. Description:The same property is changed in different manners. Description: A containment relationship is added to a class which is concurrently deleted. This scenario tests whether a delete is correctly propagated to contained elements if the containment is expressed in a language specific way and not physically existing in the model. Working Copy 1 (V0'): Deletion of a class. 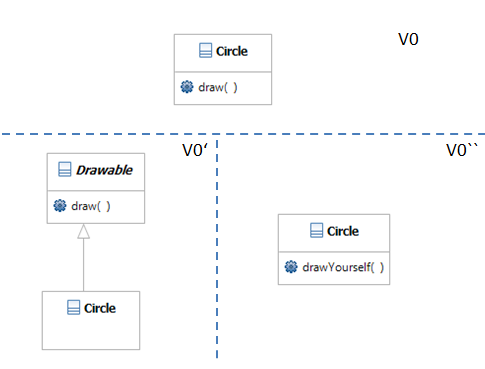 Working Copy 2 (V0''):Addition of a (language specific) containment relationship for the class the other modeler deleted. Expected Conflicts: Concurrent Overlapping Changes. Delete Update Conflict including the mark that Engine is deleted logically. 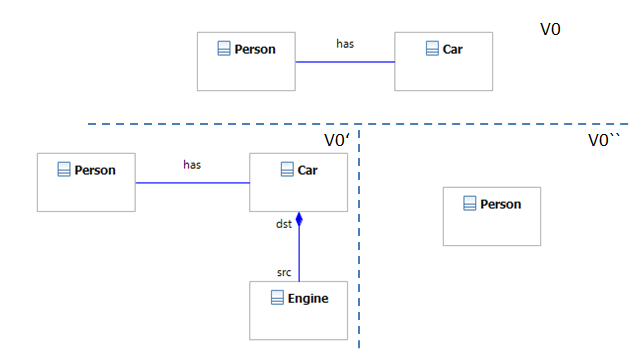 Expected Merge Result:Only the Person Class is kept or both Car and Engine are kept in the model. Description: A class with the same name is added in both working copies. Origin Version:A single class A. Working Copy 1 (V0'): A class B is added. Working Copy 2 (V0''): A class B is added. Expected Conflicts: Overlapping Concurrent Changes. It should be reported that the same model element has been added. Expected Merge Result: The merge ends up in model with class A and only one class B. Description: This scenario tests whether contradicting intentions of the operations are correctly considered. From a syntactic point of view a naive merge would not report any conflicts. 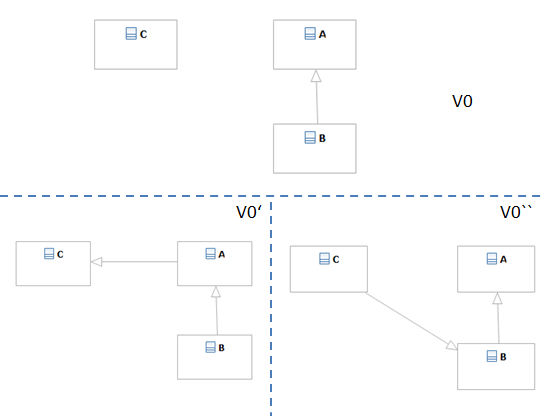 Origin Version: Two classes with the same two methods each. Working Copy 1 (V0'):Refactoring: Extract abstract super class pulling up two methods. Working Copy 2 (V0''): Refactoring: Extract abstract interface pulling up two methods but leaving the implementation in the concrete class. Expected Conflicts: Equivalent Overlapping Changes. It should be indicated that the overlapping express similar intensions. Expected Merge Result: User has to be asked which operation should be omitted. 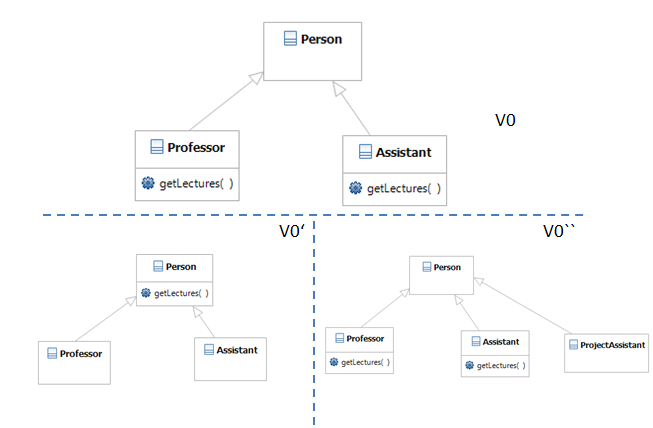 Description: One modeler adds an association to a class wheras the other removes this class. Origin Version:Two classes which are not connected. 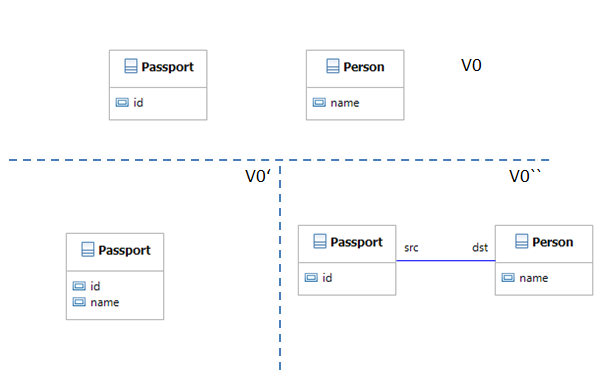 Working Copy 1 (V0'): The attribute of the Person class are movd to Passport and Person is removed. Working Copy 2 (V0''): An association is added. Expected Conflicts: Syntax Conflict. The merged model would contain a dangling reference. Expected Merge Result:User has to be asked which operation should be performed. 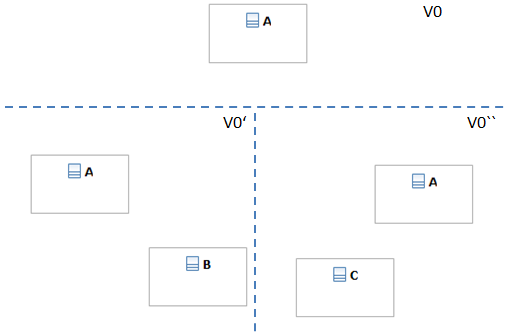 Description: The merged concurrent modifications result in an inheritance cycle. Origin Version:Three classes A, B, C where A is a superclass of B. 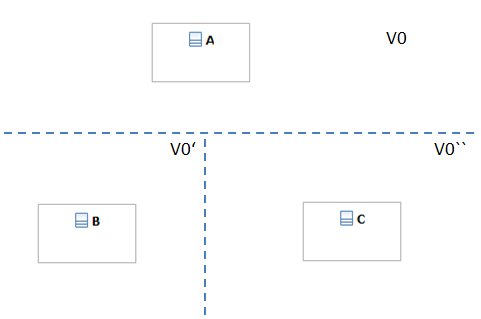 Working Copy 1 (V0'): A inherits from C.
Working Copy 2 (V0''): C inherits from B. Expected Conflicts: Syntactic Conflict. 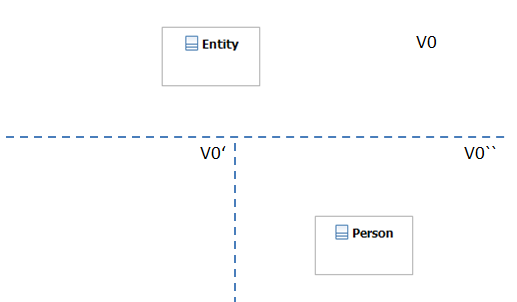 Violation of the metamodel should be reported. Expected Merge Result: One solution has to be selected. Description: Combining the changes of both modelers results in a violation of the metamodel. Origin Version: The classes Car and Engine are related by an association. Working Copy 1 (V0'): The multiplicity is set to unbound. Working Copy 2 (V0''): The composition property is set to true. Expected Conflicts: Syntactic Conflict. It should be reported that the merged version would contain a composition with an multiplicity higher than one. Expected Merge Result: One change has to be selected. As the modifications also reflect different intensions of the two modlers (types vs. instances of Engine), a redesign might be necessary. Description: Due to concurrent modifications, a new class inherits some methods which it did not inherit in the original model. Origin Version:A model containing three classes where two classes inhert from a common super class. These two classes contain the same method. Working Copy 1 (V0'): The method contained in both subclasses is shifted into the superclass. Working Copy 2 (V0''): A new class is added which also inherits from the superclass. Expected Conflicts:A semantic conflict. Maybe it is not intended that the new class inherits the shifted method. Expected Merge Result: Depending on the modeler' intension. No automatic decision possible. Description: Two modelers express the same information in different ways. Origin Version:A class person is given. 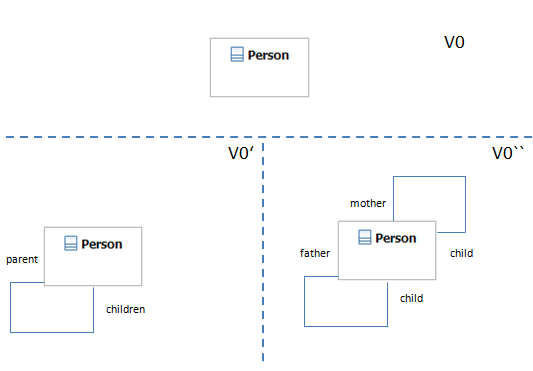 Working Copy 1 (V0'): One modeler adds an association with role parent and children to express that a Person may have some children. 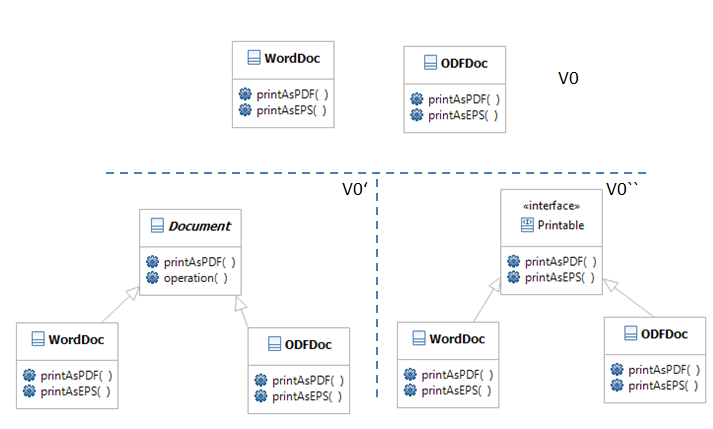 Working Copy 2 (V0''): The other modeler adds two associations, one for the mother and one for the father of a Person. Expected Conflicts: Semantic conflict. The same facts (namly that the parents (mother and father) of a Person are Persons and that the children of a Person are Persons. Expected Merge Result: One solution has to be chosen. Description: The property of a class is modified and the same class is concurrently deleted. Working Copy 1 (V0'): The class Entity is deleted. Working Copy 2 (V0''): The class Entity is renamed to Person. Description:The container of a new element is deleted. Origin Version:One class Personwithout attributes. Working Copy 1 (V0'): Class Person is deleted. 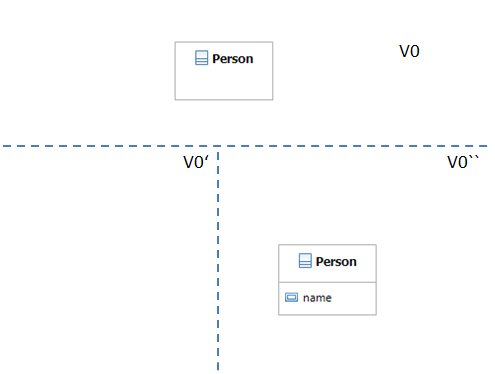 Working Copy 2 (V0''): An attribute name is added to Person.